C1087. 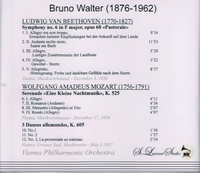 BRUNO WALTER Cond. Vienna Phil. : 'Pastorale' Symphony #6 in F (Beethoven); Eine Kleine Nachtmusik, K.525; Three German Dances, K.605 (all Mozart). (Canada) St Laurent Studio YSL 78-111, recorded 1936-37. Transfers by Yves St Laurent. “Initially Bruno Walter trained as a pianist, entering the Stern Conservatory in Berlin when he was eight years old, and making his public début the following year in a student performance of Beethoven’s Piano Concerto #2 with the Berlin Philharmonic Orchestra. However, after hearing Hans von Bülow conduct in 1889 and visiting the Bayreuth Festival two years later, Walter decided to pursue conducting as a career. As a student he conducted the Berlin Philharmonic in 1893 in a setting of Goethe which he had composed himself, and later that year he joined the Cologne Opera as a répétiteur. It was with this company that Walter made his professional début as a conductor, in Lortzing’s DER WAFFENSCHMIED during 1894, and the following autumn he joined the Hamburg Opera as chorusmaster. Here he worked closely with Gustav Mahler, the company’s chief conductor, who proved to be a major influence upon the young musician, and who secured for him his first conducting post, as first conductor at Breslau in 1896. At the start of the following season Walter moved to the same position in Pressburg (now Bratislava); and after a year there he went to Riga where he stayed for two seasons before taking up a conducting post at the Berlin Court Opera, the leading opera house in Germany at this time. Here Walter’s colleagues included Richard Strauss and Karl Muck; at the end of 1900, he conducted the first performance of Pfitzner’s opera DER ARME HEINRICH. Mahler invited Walter to join him as a conductor and assistant at the Vienna Court Opera where he was based from 1901 to 1912, composing as well as conducting: the première of his Symphony #1 took place in 1909. Increasingly active as a guest conductor, Walter made his début at the Royal Opera House, Covent Garden in 1910 with Wagner’s TRISTAN UND ISOLDE and Ethel Smyth’s THE WRECKERS. Following Mahler’s death in 1911 he conducted the first performances of his DAS LIED VON DER ERDE in Munich and of the Symphony # 9 in Vienna (1912). By now, established as one of the most promising conductors in Europe, in 1913 Walter accepted the post of chief conductor at the Court Opera in Munich, where he remained until 1922. Here he conducted the first performances of Korngold’s VIOLANTA and DER RING DES POLYKRATES (1916) and of Pfitzner’s PALESTRINA (1917). However during 1921 he became the target of anti-Semitic attacks in the Völkischer Beobachter, and he resigned from his post during the following year. Walter made his first appearances in America in 1923, conducting in New York, Detroit, Minnesota and Boston, and two years later he made his début at the Salzburg Festival and was appointed chief conductor at the Berlin Städtische Opera (or Municipal Opera) having been a regular conductor of the Berlin Philharmonic since 1919. During the late 1920s, he continued to enjoy great success as a guest at Covent Garden; first appeared at La Scala, Milan, in 1926, where he came into contact with Toscanini; made a great impression in Paris with a cycle of Mozart operas in 1928; and conducted for the gramophone. He resigned from his Berlin post in 1929 and took up the position of chief conductor of the Leipzig Gewandhaus Orchestra, succeeding Furtwängler; but with the election of the National Socialist administration in 1933 Walter was immediately prevented from conducting in Leipzig and Berlin. As a consequence he left Germany, making Vienna the centre of operations for his activities until the Anschluss of 1938. Walter conducted several notable productions at the Salzburg Festival, served as artistic director at the Vienna State Opera between 1936 and 1938, and was recorded in concert performances of Mahler’s DAS LIED VON DER Erde (1936) and Symphony #9 (1938) with the Vienna Philharmonic Orchestra. Although he was offered and accepted French citizenship in 1938, Walter emigrated to America with his family in 1939, settling in Beverly Hills in California. During the war years Walter was active as a conductor principally in New York, appearing with the New York Philharmonic Orchestra (later serving as artistic adviser between 1947 and 1949) and with the NBC Symphony Orchestra, and at the Metropolitan Opera, leading productions of operas by Beethoven, Mozart and Verdi. He also conducted many major orchestras such as those of Chicago, Los Angeles, Philadelphia and San Francisco, and continued to record, establishing a close relationship with the American Columbia label which lasted until his death. He returned to Europe as a guest conductor after the end of World War II, his appearance at the first Edinburgh Festival in 1947 helping to establish it in the annual musical calendar. During this period Walter forged a close musical relationship with the short-lived English singer Kathleen Ferrier, whom he accompanied at the piano in recital, as well as conducting in unforgettable accounts of DAS LIED VON DER ERDE both in concert and on record for Decca. In 1950 Walter made his first appearance in Berlin since 1932, but during the 1950s gradually reduced his commitments, a process which was accelerated by a heart attack in 1957. With the commercial introduction of stereophonic records in 1957, Columbia invited Walter to re-record several major items of his repertoire in California with a hand-picked orchestra, the Columbia Symphony Orchestra, whose personnel was drawn largely from the orchestras of the major Hollywood studios. He made his final appearance at the Metropolitan Opera in 1959, conducting Verdi’s REQUIEM, and gave his last public concert in Los Angeles in 1960. His final recording sessions took place in March 1961 and he died of a further heart attack in the following year.